Developed by Double Helix. Published by Capcom. Released February 18, 2014. Available on PS3, Xbox 360, PS4, Xbox One (reviewed), and PC. Reincarnating a beloved franchise is delicate work. Some folks hate the idea, while others relish it. The former can point to things like Duke Nukem to drive home their point. The latter has the likes of DuckTales Remastered to make their case. The biggest problem with reboots like this, of course, is that you don't really know whether it's going to bring you the joy of reliving your fondest childhood memories, or ruin them entirely by failing to grasp what it was that made the game good to begin with. Double Helix took the challenge with Strider, an arcade game from 1989 that was popular enough to warrant release on virtually every imaginable platform over the years. You played as Hiryu, the badassest high-tech super ninja ever, climbing around and slashing to bits anything that stands in your way. 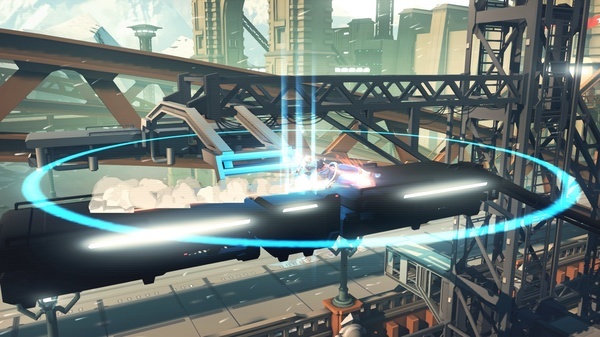 It was an innovative side-scrolling action platformer, and it was glorious. 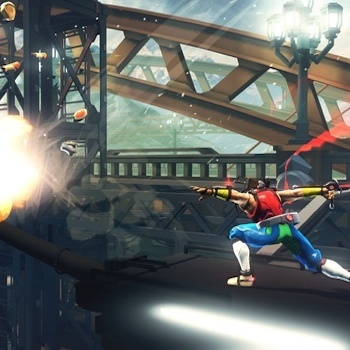 From the first level of the new Strider, you know you're in for something more familiar than not. While many aspects of the game have been updated, the core of the gameplay is still the same. 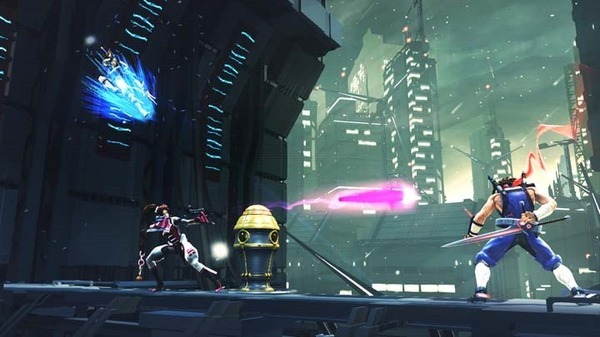 You jump around, latching onto walls and platforms, slashing away with your flashy plasma sword. 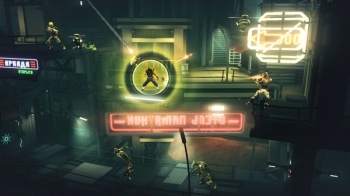 You dodge the laser fire from the robotic bad guys as you close the gap enough to hack them to pieces, or just reflect the shots back at them once you've picked up that upgrade. The core gameplay is elegant in its simplicity, harkening back to an era of only a d-pad or joystick and two action buttons. While the gameplay itself is delightfully old-school, unfortunately so are the enemies. They don't vary up very much, offering scads of robo-soldiers each armed with one of only a few weapons. While this was simply a limitation of the technology back in the 80's, it would seem prudent to mix up the regular enemies at least a little bit more two decades later. They are at least color coded based on difficulty, another throwback to classic design. Of course, the troopers are just cannon fodder, and the real enemies are the bosses and mini-bosses that are significantly more varied as you progress through the game, although even they suffer from this repetitive issue to some extent. The mini-boss fights basically act as introductions to a new rare enemy type, serving largely as a tutorial on how to defeat them in future encounters. They might be tough the first time you fight them, but once you've got the hang of it, you can take on two at a time in a room full of troopers without breaking a sweat. 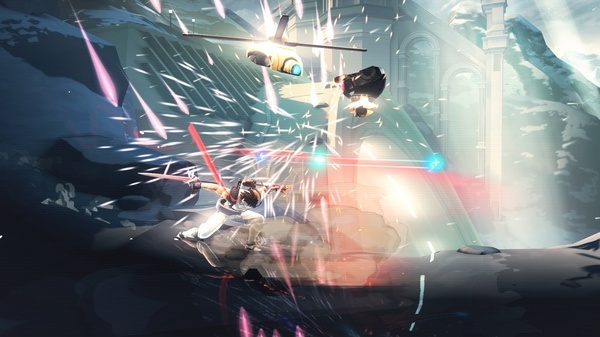 On the one hand, it makes you feel like you are the ninja when you clear the room with two mini-bosses and a half dozen soldiers, but it can get tiresome after several similar encounters with the same not-quite-mini-boss. The boss fights are a different story entirely. 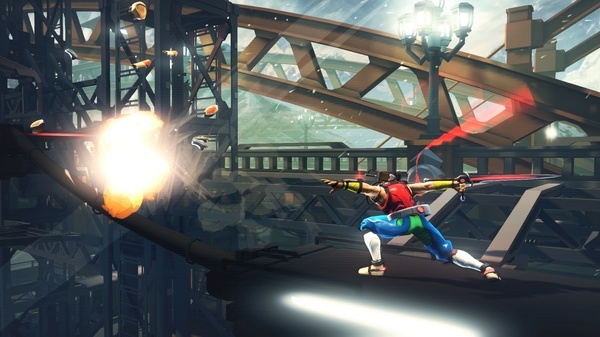 You'll encounter other ninjas, just as dexterous and dangerous as Hiryu himself, which you'll have to race around the screen and outmaneuver to take down. Then, of course, they really throw a spanner in the works by pitting you against two of them. It's exhilarating to see the boss you struggled to take down come back with a friend a couple levels later to show you what's what. Some of these encounters can be a bit tedious, but they all have their patterns that you just need to learn to defeat them. The world map is a segmented view of Kazakh City, with you traversing each section in turn as you progress through the game. You'll unlock new abilities and upgrades as you explore the map, as long as you're diligent about checking every corner and have a watchful eye out for hidden passages and the like. 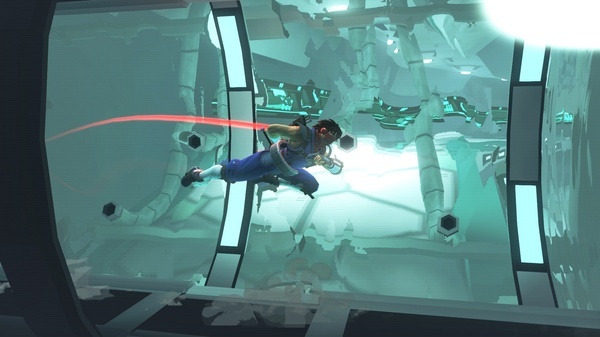 You get the staples like Double Jump early on, and other neat tricks like the ability to reflect weapon fire back on the shooter with a swing of your blade. You'll get health and energy upgrades - you'll use energy to call down a flaming bird of destruction upon your enemies - increasing the length of the respective gauge. 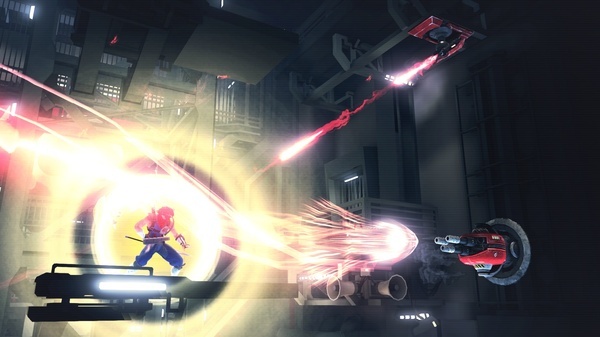 If you've been looking forward to Strider, it will offer exactly what you're looking for with the retro feel of gameplay, enemies, and mapping, and the modern touches of impressive visuals and matching soundtrack. While the updated graphics are beautiful for the most part, the way it's layered can cause some confusion as to what is in the foreground vs the background, so you might end up jumping for a ledge that isn't there on more than one occasion. 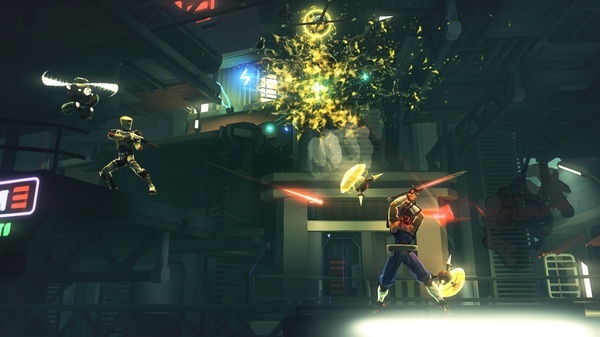 For the genre, Strider delivers a sizeable amount of gameplay. Your first playthrough will likely last you several hours, unless you're just a platformer savant. It's not all that hard for the most part, but there are a couple of decent challenges scattered throughout, and you can always crank up the difficulty if that's your thing. 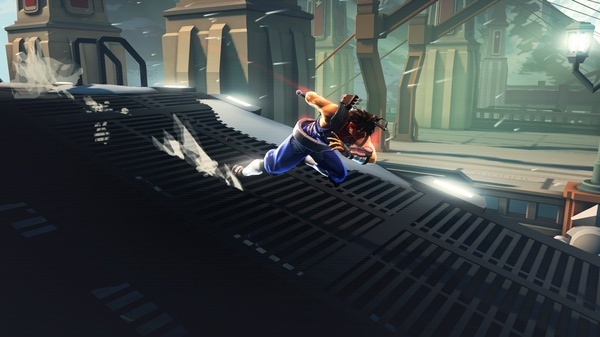 Ultimately, Strider is an action platformer and it doesn't really try to pretend to be anything else. The challenge lies mostly in the combat, not the platforming, so, while there are environmental challenges interspersed throughout, they're not the focus of the game. Be prepared to swing your weapon pretty much the entire time you're playing. 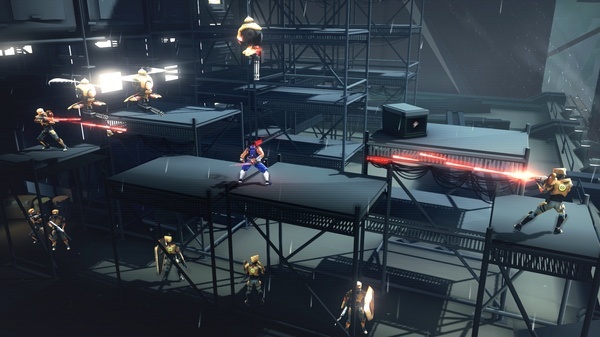 Bottom Line: Strider is a stellar example of how to remake a classic. It sticks to the original where it should, and modernizes where the classic formula can be improved. Recommendation: Action platformer fans will love it, but if you prefer environmental challenges in your platforming experience, it may leave you wanting.